The California Golf Club of San Francisco dates back to the Golden Age of design and, although the club can trace its roots back to 1918, California Golf Club did not truly come of age until it moved to its present site in the mid 1920s. The club originally commissioned little known Scotsman Willie Lock to design the course on the new site in the fashionable Bay Area, but an Irishman, Arthur Vernon Macan, replaced him before construction started. It’s unclear as to why Locke was replaced by Macan but we do know that Locke routed California, so he should receive posthumous credit. Alister MacKenzie was drafted in to address shortfalls in California’s bunkering in 1927 and since then the club’s reputation soared. Former Walker Cup player Gene Andrews won the US Senior Amateur Championship here at the California Golf Club of San Francisco, which was probably the club’s proudest moment. In 2005, after years of struggling with putting surfaces infested with roundworms, the club decided to rebuild the greens and Kyle Phillips was the chosen architect following a dramatic proposal. Not only did Phillips rebuild the greens, he also built five new holes so that the club could boast a stronger outward nine to complement the existing excellent homeward nine. The California Golf Club of San Francisco can now boast tournament measurements. From the new back tees, which are aptly called Venturi, the course can be stretched to more than 7,200 yards. Cal Club and Kyle Phillips take a bow. Doak’s Bel-Air restoration is impressive, but the vision and execution shown on this property has produced one of the best routings I have played in California. The two new holes, the 7th a cape hole and the 8th, a long par 3 down the hill, guarded by bunkers short, and a unique double bunker shared with the 3rd 'Signature' hole are both natural and feel like they were always there. However for me it's the tree removal and rugged MacKenzie bunkering that really make this place shine. When I played last week they were still removing trees on the par 3 6th hole which has views north back over the bay and to the snow-capped mountains beyond. If I had to be uber-critical, the tree removal has left one of the great short holes, 16, exposed to the housing behind the green, but the green complex itself has plenty of interesting pin placements, including I am told, front left which has been known to yield a hole-in-one or four. Can't wait to get back and see this place playing firm and fast during the summer. Cal Club is definitely one of the best golf courses in the world. It's a very difficult course with a great layout. The course also has awesome views of South San Francisco. It's always in amazing condition and plays hard and fast. When I played it this summer, it felt like I was playing a practice round for a US Open. The course could easily host a major championship or a Ryder Cup. I can't believe Golf Digest doesn't have Cal Club ranked inside their Top 100. Makes no sense. See other reviews from Johnny K.
Cal Club takes all the great elements of San Francisco courses and puts them all in a gorgeous 18 holes making it, in my eyes, as the best track in San Francisco. Do you want an excellent routing up, down and through hills? Cal Club has it. Do you want rugged bunkers and speedy greens? Cal Club. Want a golf course that gives you awe inspiring holes, jaw dropping cape holes and challenging par 3s? Cal Club again. It may not get the limelight of of an Olympic or a Harding Park. It may not have the intrigue of SFGC but Cal Club is the complete package, 18 quality holes that will entice you to play it again and again. Play it if you can and make sure to spend as much time as you can on the 6th green. Cal Club was the recent beneficiary of an amazing renovation by Kyle Phillips, part of a run of wonderful new courses and excellent renovations by his team. Removing thousands of trees this course was totally transformed into an awesome course of the highest caliber that is truly fun and playable by all abilities. 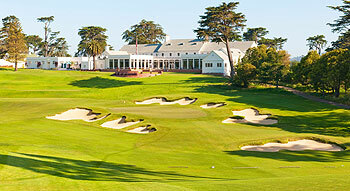 In fact, it’s so good that it is now vying for the top spot out of the San Francisco golf courses. For the author it’s far more fun than the Olympic Club and definitely gives San Francisco Golf Club a run for the #1 spot. Some of the major aspects of the renovation include greatly widening the playable areas, fairways width and short grass. Green surrounds have been shaved down allowing a multitude of playing and recovery options. The ground game is now a vital part of a round at Cal Club and this works perfectly with their extremely firm and fast conditions. One of the other strengths of the course now is the incredible variation in holes on this hilly property. The new holes Phillips added are fantastic. His cape hole rendition makes perfect use of a previously unused area of the course and perfectly links up with the long par 3 8th hole. Note worthy is the quirky but creative use of a double bunker separating the green of the 4th but seamlessly tying everything visually together. The back 9 maintains the high level set out on the front and works out and back from the clubhouse making perfect use of the hilly terrain. My favorite hole on the back 9 is the drop shot par 3 16th. As I learned the hard way the miss is not short as the recovery shot you are faced with is straight up a steep slope, a tough play from a tight lie. What makes the hole great is the fact that you play it with a short iron like a 9 or a wedge and that from a highly elevated tee and yet there is really no easy shot, even with the shortest clubs in the bag. Cal Club has simply become a great course, no other way to look at it. The author is already extremely looking forward to a return visit one day. Since the outstanding restoration of the MacKenzie bunkers and routing by Kyle Philips, this club has gone from strength to strength. Little is known about “the Cal Club” due to its exclusivity and being slightly overshadowed by the Golden Age giants located in the Bay Area. When I teed it up here a few years ago, it captured my heart and quickly became a personal favourite. Of all the courses on my Golden State itinerary, the California Club was the one I was looking forward to the most. The restoration has been the catalyst for the club’s rising national and world ranking, and I can only anticipate continued future success. The conditioning may well have been the best of all the courses we played, with the greens running at 12.5 that morning. The routing is world-class and the bunkers are magnificently created offering an abundance of memorable uniqueness. Each hole was designed with such individuality and the progressive flow of the course is wonderful. You’ll find yourself saying “wow” on many of the tee boxes. You only need to play this course once to remember every single hole. The front nine is tight through the tall trees with wonderful rolling topology and exciting uphill and downhill holes. The back nine opens up with arguably the greatest bunker complexes in the world, particularly on holes 12 and 16. Thank you Dr. MacKenzie for leaving us with this masterpiece. Great club and membership with a top notch championship golf course. It's a tough track that was restored by Kyle Phillips who rerouted a number of holes. One of the best in state. The superintendent was named superintendent of the year (for the USA) in 2011.